In our first drive review, we concluded that the new-gen A4 was an improvement over its predecessor in almost every respect. Perhaps the one thing to be seen was whether the downsized engine was good enough to keep with its rivals or if it was too big a sacrifice. After putting the A4 through our comprehensive test cycle that includes driving through Mumbai's shameful roads, we have a verdict. Read on. Rahul summed up the A4 perfectly when he called it the automotive equivalent of an athletically built person in a perfectly tailored suit. 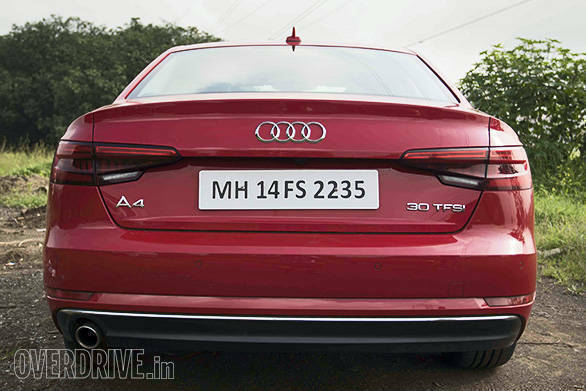 The A4 is instantly identifiable as an Audi but looks sharper thanks to taut lines in the bodywork and edgy looking lamps both front and rear. These are not matrix headlamps but they are full LED and feature Audi's cool running indicators that scroll outwards. I'm a big fan of the new interior design that is both restrained and highly luxurious. The entire dashboard appears very slim and tilted back. This not only increases the sense of cabin space but also opens up more room for the front passenger's knees. The continuous line of air vents looks great, but it should be mentioned that the central two vents in front of the passenger are dummies. If for some reason you don't like the lovely wood trim, it can also be optioned in brushed aluminium. It's also great to see sensible door pockets all around that can hold water bottles. The front seats are comfortable and cabin ergonomics are almost perfect except for the recessed 12V socket in the dash that is a little hard to reach. Rear-seat space is improved but still not great and can be deemed as adequate at best. In fact, none of the cars in this segment have outstanding knee room. For reference, with the front seats adjusted for a 5ft8in tall driver, the Honda Jazz offers more rear knee room than the A4. Boot space is quite good and although it isn't very tall, the boot extends well into the car. Neatly recessed under the boot floor is a space-saver spare tyre. The A4 offers great connectivity with two USB ports and a segment first compatibility with both Android Auto and Apple CarPlay. There are quite a few segment firsts in this car like Audi's lovely high-res digital instrument cluster that allows you to blow up a navigation map or revert to standard-sized dials flanking a multi-information display. The central MMI screen is also very high-res and controlled by a scroll wheel. The MMI controller has a touch-sensitive pad that allows you to scrawl a navigation address or phone number without taking your eyes of the road. The process is a little slow but the writing recognition is quite accurate. 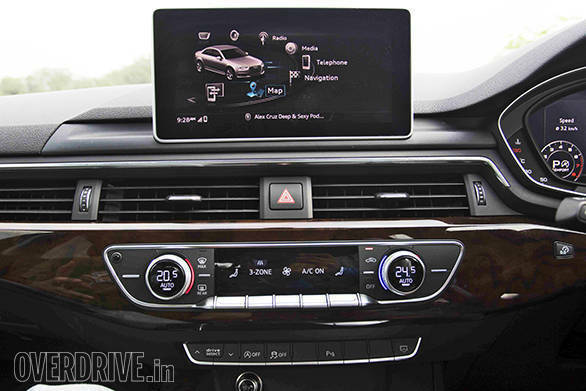 There are also eight buttons that can be pre-programmed to anything you like from MMI, be it a navigation route, your favourite radio station, or even a contact you call frequently. This is also the first car in the segment with three-zone climate control with separate climate controls for rear passengers. One glaring absence though is the fact that this is another Rs 50 lakh luxury car that doesn't offer keyless entry as standard. Ridiculous. This was perhaps the most pleasant surprise of the package - the little 1.4-litre engine doesn't feel like a big compromise. 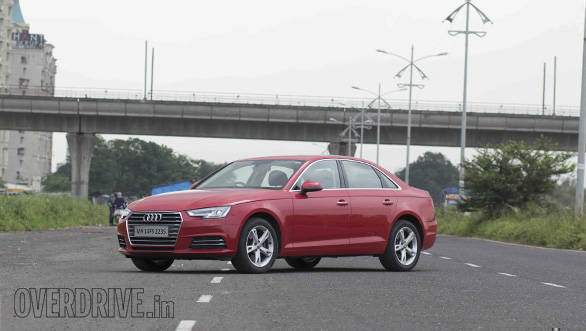 With 150PS and 250Nm, it is at least 30PS down on its rivals, but the A4 served up pretty impressive performance. We managed an 8.6s 0-100kmph run, only half a second slower than the Mercedes-Benz C200. 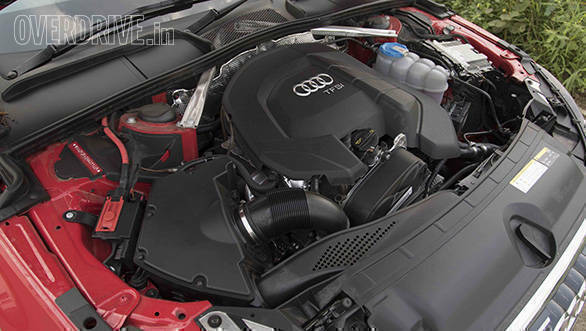 Sustained highway speeds are relaxed with the engine hovering just above 1,500rpm in seventh gear at 100kmph. Of course, the in-gear acceleration lacks the punch of some of its more powerful rivals, but this level of performance is perfectly acceptable. That said, I still wish Audi offered the 1.8-litre engine, not for the performance but because it is significantly more refined. As we found in the Skoda Octavia, the 1.4 is a slightly vocal engine and you hear it having to work, where the 1.8 is super smooth and completely unstressed. The 1.4's refinement is actually quite good, but at this price point it's fair to demand more than quite good. Fuel efficiency is quite good - with an overall figure of 12.5kmpl, it is more efficient than all its rivals. However, as performance is not significantly worse, efficiency is not significantly better and all three rivals offer about 11kmpl. The engine is mated to a 7-speed dual-clutch automatic that offers delightfully crisp and quick shifts that are all the more fun thanks to steering-mounted paddle shifters. Sport mode in the gearbox hastens downshifts and holds on to revs longer for more urgent performance while Drive mode keeps things more suited towards efficiency. Audi offers four modes through Drive Select: Comfort, Sport, Automatic and Individual. These affect engine response and steering heft while suspension remains unadjustable. The A4 has been set up for plush ride and it is one of the most comfortable cars in the segment, if not the most. Minor bumps and undulations are well absorbed, but some of the larger craters around Mumbai do cause a thud. Ground clearance is practical and we had no scraping issues. City drivability is excellent as the steering is light but direct, and the car feels quite compact and easy to manoeuvre. As with most German luxury cars, high-speed stability is rock solid. Handling is good with quick turn-in and decently controlled body roll, but the A4 is better at being comfortable than it is at exciting, and BMW 320i and Jaguar XE are more driver focussed. 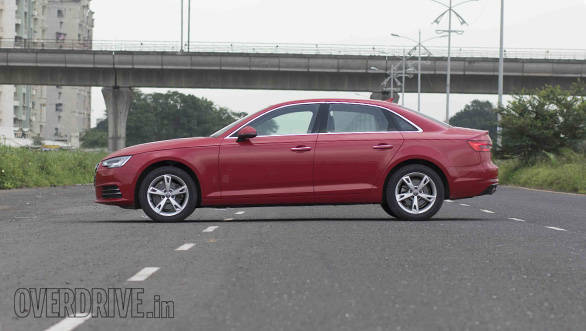 When Audi launched the A4, they said that the car would offer the best features in the segment but it would also come at a price. At Rs 53 lakh on-road Mumbai, it is on a par with the 200PS Jaguar XE in middle-spec Prestige trim. More importantly, it is Rs 2 lakh more expensive than our current segment champ, the Mercedes-Benz C200 Avantgarde. 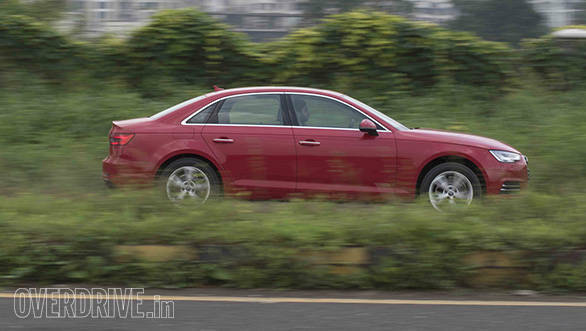 For the money, the Audi gives you handsome looks, a great cabin and superb features. 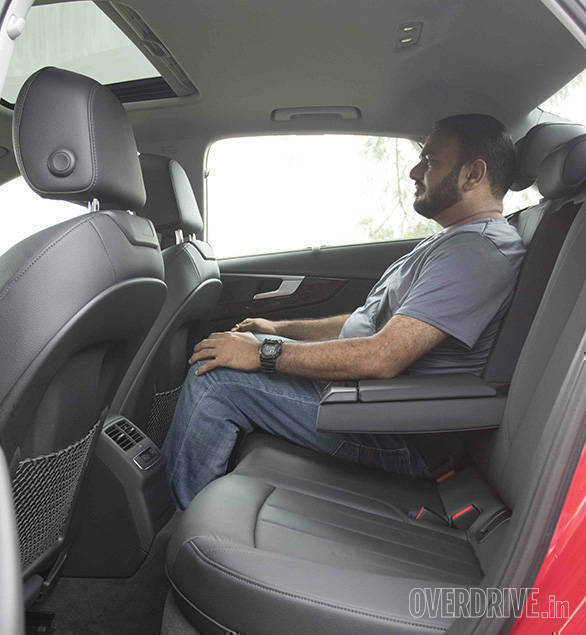 It also offers a comfort-oriented driving experience that would have been unbeatable with a more spacious rear seat. As of now, it's too close to say whether this is the segment best and we look forward to a comparison test!